Stephen Bailey walks around Berlin’s edgy, sub-cultural response to its past. 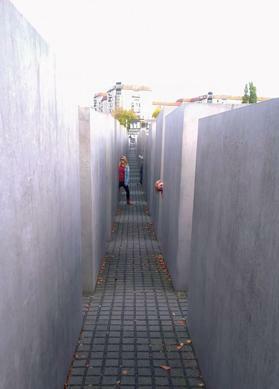 The Jewish memorial is perfect for hide and seek. 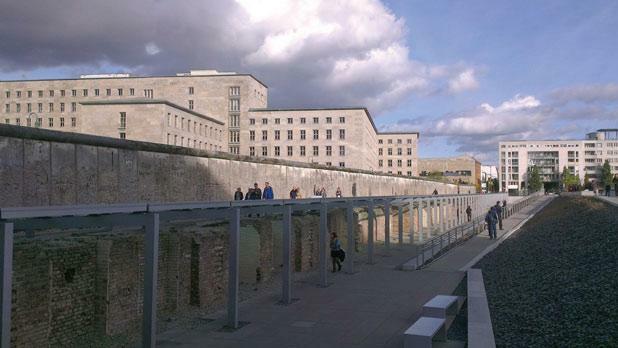 The longest remaining section of the wall. Bleak buildings behind what is left of the wall. Tentatively, I walk along Kreuzberg's busy streets. Men walk past clutching bottles of beer, colourful graffiti covers buildings, and pounding bass escapes from many apartment windows. At first glance there is a strong whiff of decadence to this Berlin district, the roads consumed by public drunkenness and a thriving sub-culture. There's an inherent edginess, but I don't feel threatened. 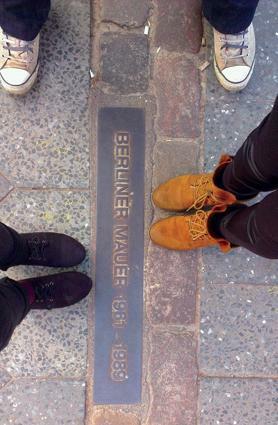 Straddling the Berlin Wall’s remains. It was the youth of this divided district that embodied the campaign to reunite Berlin and their free ideals live on in the city. 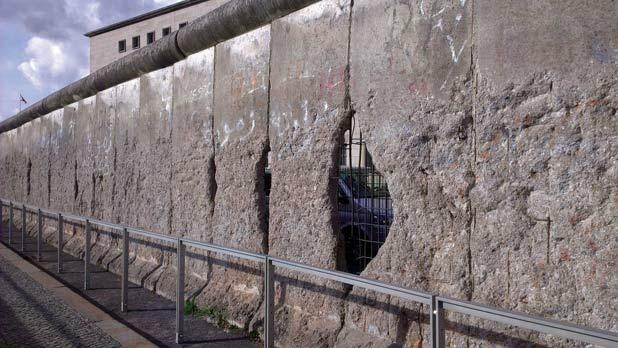 From the centre of Nazi Germany, Berlin was soon the centrepiece of the Cold War, and 200 metres of the original Berlin Wall remain. Small sections are dotted around the capital, vivid reminders of the Cold War's frontline. Last month, the city marked 25 years since the wall was mostly torn down. At Checkpoint Charlie, gun turrets and concrete barriers have been replaced by a public city beach. Russian and American tanks stared each other down across this checkpoint and judging by the deckchairs advertising Lucky Strike cigarettes, the latter still has an impact in the city. The wall's original foundation bricks have been retained and run along the road. I follow them with a straddled walk, keeping myself on both sides until an apartment building bravely stands in both east and west. Residents might be cooking in what was the communist second world before nipping to a Western first world toilet. But between 1961 and 1989, almost no one crossed this barrier. The Soviets constructed it to prevent East German residents emigrating to the west and it came to symbolise the so called Iron Curtain. It's stark and ugly, the drab concrete making no pretence over beauty, particularly as I come across its longest surviving continuous section. With a concrete warehouse the wall and an ominous cloud lingering, I can almost transport myself back to the 1960s. However, on its Western side vibrant graffiti remains and this art form continues to be a form of cultural activism. From greyness there is suddenly colour. In Kreuzberg almost every building is painted. Some display elaborate works, the vivacious use of colour a vast improvement on the undercoating. In other places huge swathes of the street shrivel under black marker. The tolerance to graffiti is universal, whether that's a creative mural or a name hastily scribbled with a dying pen. Graffiti looks at home here, even when it shouts a message from a 10th-storey apartment block. Kreuzberg is the centre of Berlin's sub-culture, a district of artists, musicians and foreigners looking to join the party. People congregate on the road, swigging from liquor bottles and competing to look the most dishevelled. Throughout Kreuzberg the squatter buildings and bars suggest an openness and tolerance – except I look too normal to gain nightclub entry. Despite few people speaking English, there is an inherent friendliness to Kreuzberg. Shops sell kebabs or waffles with a smile and tactics are shared on how to live cheaply. I’m taught how to open a beer bottle with a lighter and I'm told not to buy a metro ticket. Apparently ticket checks are non-existent and I surmise that the city government secretly promotes free travel. Like Kreuzberg, the central Mitte District was also divided and a few clues indicate the past. Trams run in the east, buses in the west. Western apartments have an extra grandeur, decorative pillars and ornamental façades suggesting an economic power. Eastern pedestrian crossing are more fun. The red and green Ampelmannchen figures have cute little hats and on green the little electronic man indicates that you must walk across with real purpose. But every city is marked by richer and poorer neighbourhoods and in general these are only superficial differences between the sides. Berlin feels united and the division only really lives on in tourist exploration. We come here for hard evidence of the city's tumultuous past, not the well-advertised attractions that I pass with little more than a cursory glance. The 18th-century Brandenburg Gate is surrounded by chariots and actors posing as soldiers. A 13th-century church tower rises 90 metres skyward. The Grand Concert Hall would enthral me in another city, but these past grandeurs feel too smooth and clean for Berlin. Asking directions, I’m aware that I'm contradicting the Anglo-German conversational pact; just don't mention the war... I'm looking for a children's playground. Beneath it lies Hitler's bunker, the hideaway where he shot himself in 1945, now tastefully buried well underground. A small information board elaborates and a six-year-old child briefly stops, before deciding against playing when an army of camera-wielding tourists descend. This is more like it, rampaging around the city seeking out brutal reminders of history. 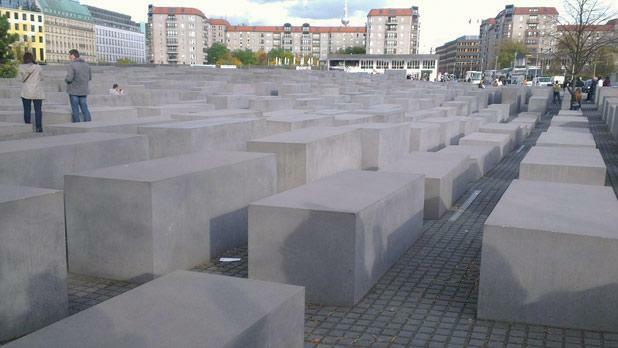 The Jewish memorial is perfect for a game of hide and seek, different-sized pillars rising and falling in the centre of Berlin. Everyone seems to be playing this game and I bump into a man chomping his way through a giant bratwurst sausage. The memorial's abstractness has come in for much criticism, although this interactive element seems fitting in a city where I never feel like a spectator. In a seemingly abandoned apartment block squatters sell jewellery and artwork. Amid a disused industrial site a wooden bar blasts out techno music. Hidden doorways lead to more hidden doorways and ambient basements of chatter and laughter. Berlin is full of little treasures like these. As a spectator the edginess becomes fearful, but all over Berlin there is an atmosphere that encourages participation and involvement. Locals ignore their lack of English to point out directions to Hitler's bunker, conversations between strangers start at metro stations and the city's style immediately rubs off on all who visit. Locals can't be proud of their past. But they're certainly proud of their present and they had a third dimension to the city. There's the east, the west, and now there is a future to enjoy.